BAGHDAD, Oct. 30, 2008 – Dover Park, as it is known by Multinational Division Baghdad soldiers, sat abandoned for years. 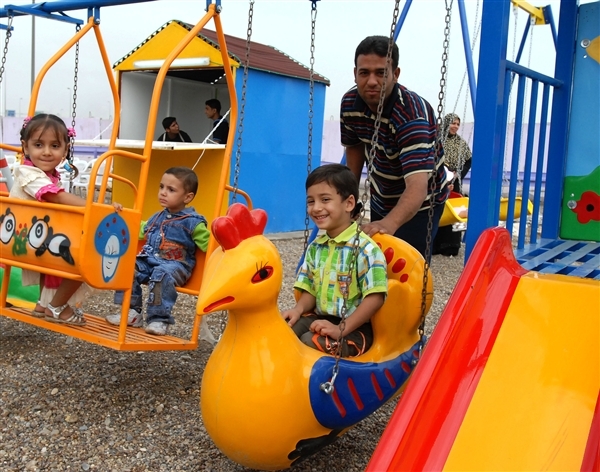 Located in the Qahira neighborhood of Baghdad’s Adhamiyah district, its carnival rides were unusable, and the land was overgrown with weeds. “As I drove by the Army canal every day, I saw this park, and I said, ‘This is something we can do to help the citizens,’” Army Col. John Hort, commander of the 4th Infantry Division’s 3rd Brigade Combat Team, said. 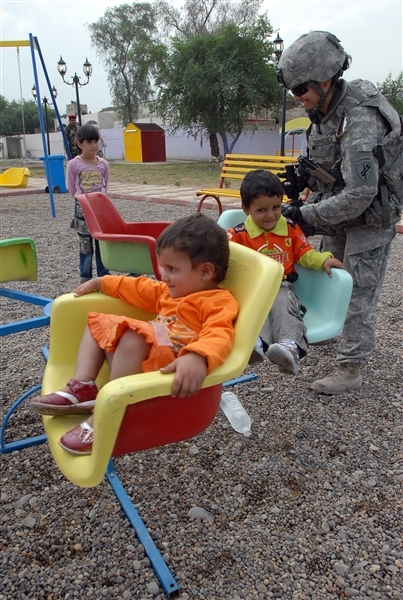 Rehabilitating the park became the mission of Army 1st Lt. Rosita Rodriguez, a civil affairs team chief in Multinational Division Baghdad with Company C, 404th Civil Affairs Battalion, attached to the 3rd BCT. Work on the park was completed in two months, and soldiers handed it over to the local neighborhood council Oct. 28. “This is our first park in Qahira. We never had one before,” said Mohamed Madaloom, the Qahira Neighborhood Assistance Council chairman. The park has a small pond with a generator-run fountain, complete with a flock of geese, as well as benches, solar lights, several swings, slides and seesaws. A tiled path is lined with flowers, and new grass has been planted. A gardener and a security guard will be hired, Madaloom said. The park is intended to be self-sufficient, and seven small kiosks will be rented to vendors. The rent will provide an income stream to buy fuel for the generator and pay the staff’s salaries and other expenses. “Everybody admires the park. I know the families are so excited to get here,” said Madaloom, who, along with other local officials and coalition forces leaders, gathered for the official handover. Iraqi officials and Hort raised the Iraqi flag to symbolize the opening of the park as doves were released. Some families and their children couldn’t wait; they were already on the rides. The younger set agrees. “It’s good. It used to be awful before. I wouldn’t even look at it before,” said Mostfa, a 3-year-old Iraqi child, before running off to a nearby slide.